Scientists have discovered new track marks on an ancient seabed in southwest China which reveal that Nothosaurs, marine reptiles that lived during the age of the dinosaurs, were able to propel themselves through water more than 250 million years ago to scoop up their prey. This discovery sheds new light on how these reptiles used a rowing motion to hunt for food on seashores. Nothosaurs were among top predators of the seas during the Triassic period, 252-66 million years ago, and were voracious semi-aquatic hunters with elongated bodies and paddle-like limb. Study co-author Michael Benton, a paleontologist at the University of Bristol in England said that, these findings settle a long-standing debate about how the ancient sea creatures swam. The paddle prints were detailed today in the journal Nature Communications. The tracks were found by Qi-yue Zhang, a member of the Chengdu Center of the China Geological Survey on a ledge, when he was mapping geological features of China’s Yunnan province. Yunnan is an area famous for its stunning fossilized sea creatures. Benton said that, “Once the team dug up the area on the ledge, 350 exquisitely preserved prints that formed about 15 different trackways, some of which looped around was exposed, and researchers used photos and airborne laser scanning called lidar to map the tracks.” The team also compared the tracks with fossils from other animals that flourished during the same period, ruling out creatures that were too small or lacked the ability to touch the seabed with their front limbs without dragging their bellies on the bottom. After this Nothosaurus was the only valid marine reptile which could reach 13 feet (4 meters) in length, and the scrappy, 2-foot-long (0.6 m). 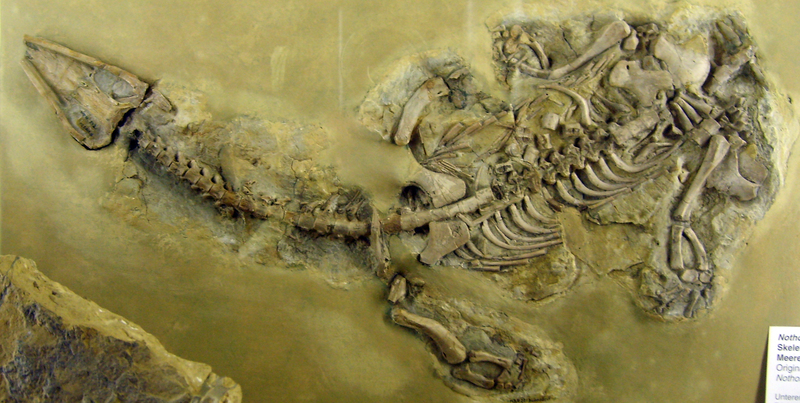 “When I first saw the site, I couldn’t believe the amazing quality of the fossils,” said Professor Michael Benton. “It’s quite unusual to find skeletons of marine reptiles such as the Nothosaurs so close to evidence of their tracks.” The discovery sheds light on the ecosystems of about 8 million years, from the devastating Permo-Triassic mass-extinction event which wiped out more 96 percent of marine species and 70 percent of terrestrial animals on Earth, also known as the Great Dying. Yunnan province, Luoping and other sites in South China are revealing Nothosaurs and other marine reptiles who were new members of the recovering ecosystems after the Permo-Triassic mass-extinction.